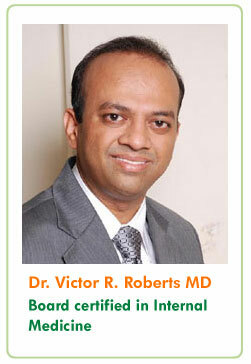 Dr. Victor R. Roberts Medical Practice is Committed to providing each Patient with an Exceptional Level of Care and Attention. We are Proud to be Physician Owned and Operated. Our Dedicated Staff works together as a Team to provide High-Quality Comprehensive Care. Our Compassionate and Understanding Doctors take Pride in paying Close Attention to each Patient's Needs. All our Practices are Conveniently located with Safe, Adequate Parking and Disabled Access. We offer Extended Services Including In-house lLab, Pharmacy, Minor Surgery, Dermatology etc and accept Same-Day Appointments and Walk-In Patients (based on availability). Medicare, Selected Plans Covered by: Blue Cross Blue Shield, United Health, CIGNA, CITRUS, AARP,. If We do not accept your insurace plan, We will give you Claim Forms to be submitted to your Health insurance provider for your reimbursement. Payments: Cash, Personal Checks, Money Orders.